Curved mouthpiece with a hinge in the center. 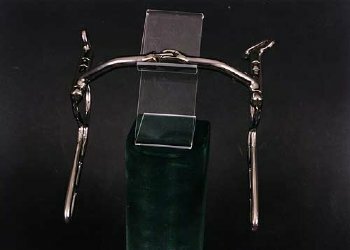 The Myler Mullen Hinge mouthpiece is a good choice for the intermediate horse. With the strength of the solid Mullen mouth, this bit encourages the horse to break at the poll. The curved mouth keeps him from getting behind the bit, or inverting. The horse that has been working in the EM 32 and is ready for the team will go to this bit. This bit can be used single, team and in multiple hitches. Also available without bushing.